The Cyber Omelette: Reddit Data Mining with Python: Are Canadians Really Sorry? Then you will need to go to reddit's app dashboard and create an app. To do this, follow the app dashboard link and log into an account. Then scroll to the bottom of the app dashboard, and click "Create App". Give it a custom name and a description. Select script from the radio buttons, and enter http://127.0.0.1 as the redirect uri. Once created, you need to retrieve your client_id, and client_secret. Those are found in the app view, with the id listed right under the title, and the secret clearly labelled. In this program we will be connecting to the reddit API with our app credentials, retrieve comments, and counting the word frequency that meet our apology conditions. Our result will be simply the printed output of the total words vs the number of apologies. The first step is connecting to our reddit account. That can be done with the following function, which returns the authorized reddit_agent. Then we will gather the comments in a get_subreddit_comments function. This uses the praw get_comments API call to retrieve comments by subreddit. We just care about the text, so we will iterate through the comments and add the comment bodies to a list. Now we just need to look through the list populated in get_subreddit_comments and count instances of apologies. What counts as an apology can be tweaked by changing the input apologies list, I have been using "sorry" and "apologies". Then we simply separate the messages into individual words, and check against our "sorry" criteria. With our three required functions defined, now we just have to put it all together in a main function. You can also retrieve our entire program so far here. 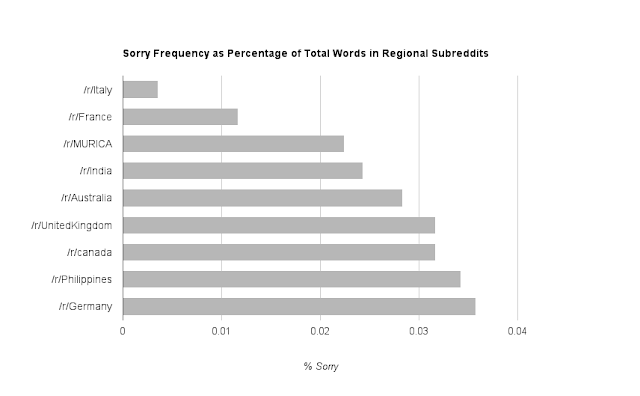 So from this data it looks like we don't apologize as much as the general world. Take that stereotypes! We gathered 1000 comments in both cases though, and there are far more total words for the world wide sample. So either Canadians don't apologize, and use far fewer words, or maybe something else is up. Let's make some changes to the code to investigate further. To get a better idea of what is going on, it would be useful to be able to change our program quickly and easily. Fortunately this just requires slight modification, allowing us to pass subreddits and search words from the command line. Those modifications can be found here. Using these changes, we can dig a bit deeper into how true the previous result was. For example, we noticed there were much fewer words in our comment list for the "Canada" sample. That's likely due to many of the provincial subreddits being less active. If we look at just /r/canada on its own, we see 0.003% (88 / 277663) apologies. Longer comments, and more apologies than /r/all! So maybe we really are sorry. 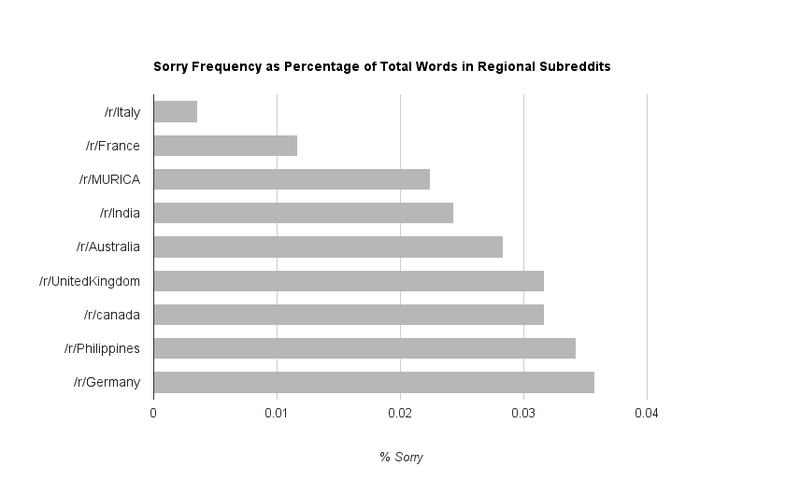 $> python word_count.py "canada" "sorry, apologies"
to compare the relative apology rates. It looks like Germans apologize the most, and Italians the least! Canada is still a solid top 3 though. Physics and language cross over.